As a Matter of Opinion: "Mad as a Hatter!" "Mad as a Hatter," actually had some truth to it? 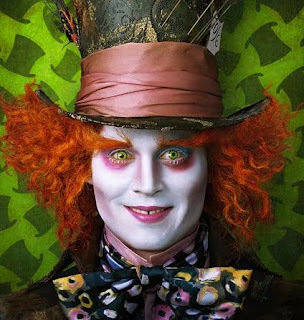 Although the name "Mad Hatter" was undoubtedly inspired by the phrase "as mad as a hatter", there is some uncertainty as to the origins of this phrase. As mercury was used in the process of curing pelts used in some hats, it was impossible for hatters to avoid inhaling the mercury fumes given off during the hatmaking process. Hatters and mill workers often suffered mercury poisoning as residual mercury vapor caused neurological damage including confused speech and distorted vision; hatmaking was the main trade in Stockport, near where Carroll grew up. It was not unusual then for hatters to appear disturbed or mentally confused; many died early as a result of mercury poisoning. However, the Mad Hatter does not exhibit the symptoms of mercury poisoning, which include "excessive timidity, diffidence, increasing shyness, loss of self-confidence, anxiety, and a desire to remain unobserved and unobtrusive." I can't wait to see it, too! My husband will not go with me and I hate to go to movies alone! Write a review after you see it! I'm looking forward to seeing it to. Just have to wait for my kids to get over their sicknesses. It is a fantastic movie. I saw the midnight showing and it was conpletely worth the lack of sleep. Beautiful, magical, epic and a vision--as if I didn't need another reason to love Tim Burton. And Johnny, Oh for the love of all things Johnny Depp--He is a Mad Hatter genuis. I loved it! I hope you do too! Thanks for the little tidbit on the mad as a hatter info (: I enjoyed that little bit of knowledge!! I actually heard this before concerning the origin of the term. I can only imagine what a fun town Stockport was :). hope you love it!!! have a great weekend!! I am so going to see this movie this weekend. And I can't WAIT!!!! Your blog has been very educational this week. :) I, too, have been looking forward to seeing the movie. Let me know if you love it! I want to go see it too. I can't wait! Seriously that's such a fun little fact! I'm actually a bit excited for something anything remotely similar to that to come up in conversation! Fantastic! I saw it today! So funny! I can't wait to see it either - I heard it is totally trippy though! And the mad as a hatter info is fascinating! Who knew?!? wow, thats an awesome bit of random information! I remember reading the mercury poisoning history for hatters, but never knew it cause withdrawn behavior. Definitely not what Johnny was goin for! I'm supposed to finally see the movie tomorrow - going for the 3-D version. Woohoo!